Immortal spirit of antiquity, Father of the true, beautiful and good, Descend, appear, shed over us thy light upon this ground and under this sky. Which has first witnessed thy unperishable fame. The best view of Patras can be found at the head of the 192 steps leading from the terminus of the pedestrian walkway Agiou Nikolaou Street up to the 1500 year-old Kastro, or Castle. The Kastro is on the city's ancient acropolis, with the sea to the west. If you can resist the temptation to look back during the climb, you can turn around at the top and be rewarded with a splendid view of the city tumbling down to the Gulf of Patras, which is an inlet of the Ionian Sea. In a direct line with the descending Agiou Nikolaou street, ten miles (16km) across the water to the northwest, rising out of the hazy sea like the end of a loaf of bread, is the 3,000-foot (900m) massif of Mount Varasova. The mountain looks like an island, but it is a headland of mainland Greece, on the opposite shore of the Gulf. 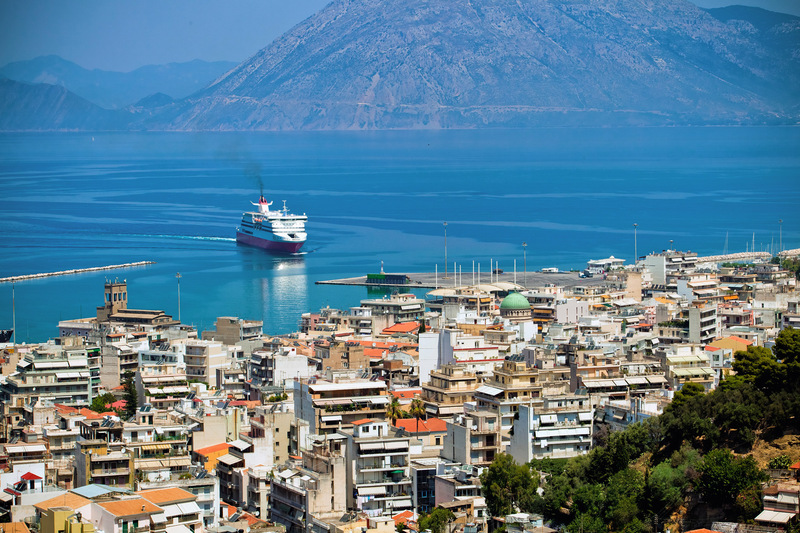 Patras is divided into an older, upper city with many restored neoclassical buildings, and a lower, more recently developed city, with winding streets and stairways connecting the two. 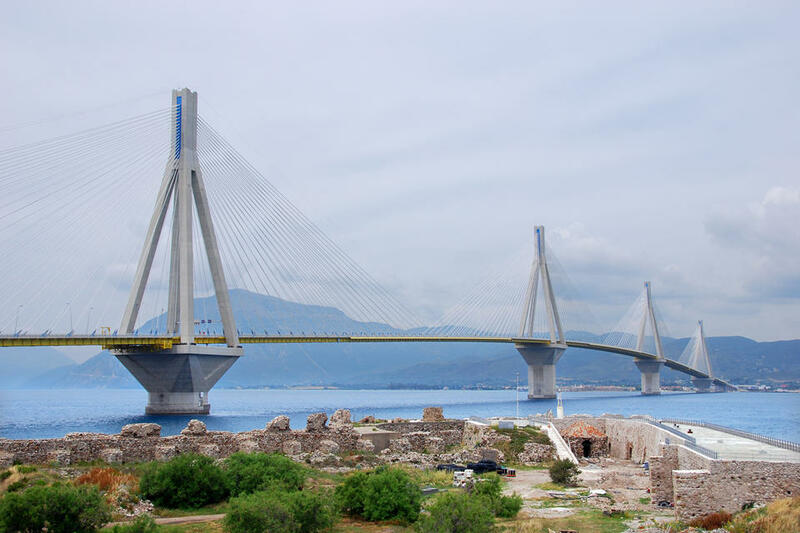 Patras, 130 miles (230km) west of Athens, is situated just west of the narrow mouth to the Gulf of Corinth, on the northwest shore of the Peloponnesian peninsula. Three of the "Eptanisa" (seven islands) off Greece's western coast are about a two hour trip from this, Greece's third-largest city (metro pop. 213,000). The three islands, who have their own beauty, are Zakinthos, Kefalonia, and Ithaca. Ithaca was the home of Homer's Ulysses. 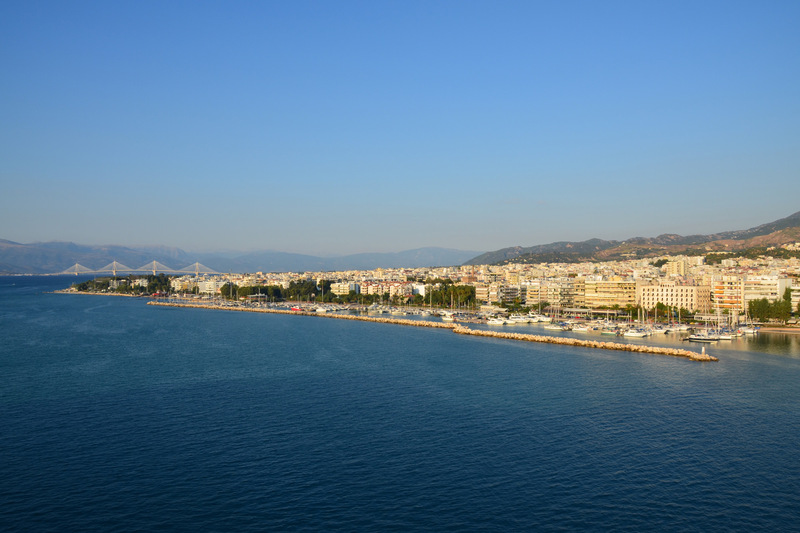 One of the reasons Patras is called Greece's Gateway to the West is that thousands of Greek emigrants passed through this port city on their way to new lands, chiefly the USA, in the late 19th and early 20th centuries. Another reason is that Patras is still a major shipping center. It has constant, close communication and trade relations with Italy and the rest of Western Europe. Patreas, founder of Patras, united three small city states around 1500 BC and named the new municipality on the northwest coast of the Peloponnese after himself. It was a quiet area of farms which were cultivated for over a thousand years, with occasional interruptions for one war or another. Patras became an important city around 150 BC, when the Romans captured the region and Caesar Augustus built a colony there around 25 BC. 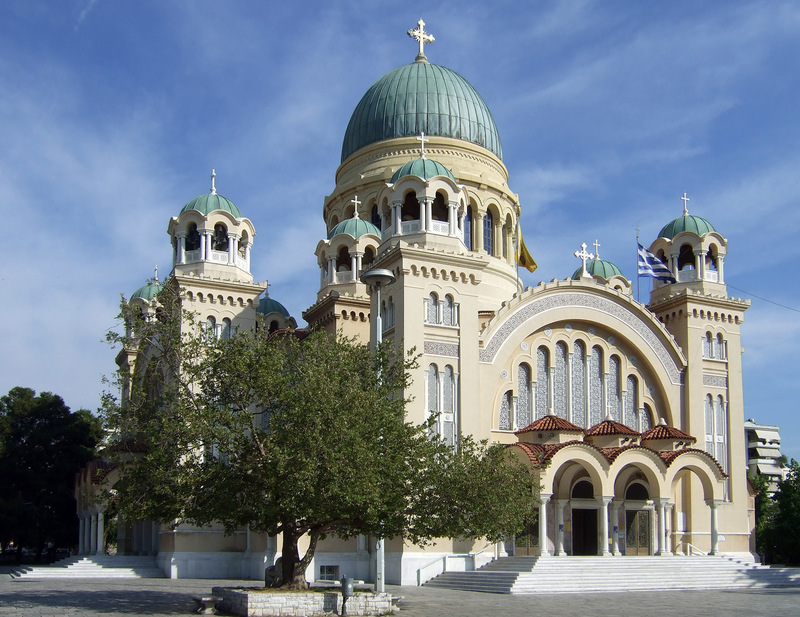 Sometime in the early first century, AD, Patras was visited by Saint Andrew, the brother of Saint Peter. 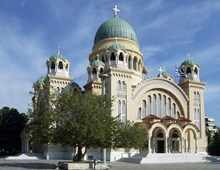 The Church of St. Andrew, in the lower city, housing some of Saint Andrews relics, is the largest church in Greece. To the west of the Kastro is the Roman Odeum, described by ancient travel writer Pausanias in 170 AD as having " the most beautiful decoration I have ever seen, excluding of course that of Athens." The New Archeological Museum is just off the Patras-Athens National road. It is the second largest museum in Greece. Opened in 2009, it features video walls, transplanted mosaics from excavated Roman villas, and open exhibits with no barriers between them and the visitor. The museum's exhibits present an excellent picture of daily life in ancient Patras. With two institutions of higher learning, Patras has a large student population. The Patras Carnival, a series of festivals held every winter in the city, is one of the largest of its kind in Europe, and attracts thousands of visitors to the city. The Spinney is a forested area above the city with a beautiful view of the surrounding area and where pine trees shade its paths. It is known as the "veranda of Patras," and has a tourist kiosk. Patras has a number of attractive public squares, among them tree-shaded Olga Square, St. George Square, and the Ypsila Alonia (high threshing floor). The birthplace of Patras native Kostis Palamas, writer of the Olympic Hymn, has recently been purchased by a Greek American and will be restored and turned into a museum. The Rio-Antirio Bridge, longest span of its type in the world, stretches 1.8 miles(2.88km) across the narrowest strait in the Gulf of Corinth, which empties into the Gulf of Patras to its west. The bridge is a work of breathtaking beauty, and has been called an engineering masterpiece. Besides the southernmost three islands of the Eptanisa, there are other places of interest outside of Patras, including the Wall of Dymaeans, said to be built by Hercules, 20 miles (35 km) southwest, Ancient Olympia,40 miles (60 km) to the south, and the Achaia Claus winery, 5 miles (8 km) southeast of the city. The region is one of the premier wine-growing areas in Greece. Thick, sweet Mavro Dafni by Achaia Claus is a favorite Greek home remedy for colds and coughs. There are also numerous public beaches on the sea road to the south and west of Patras. 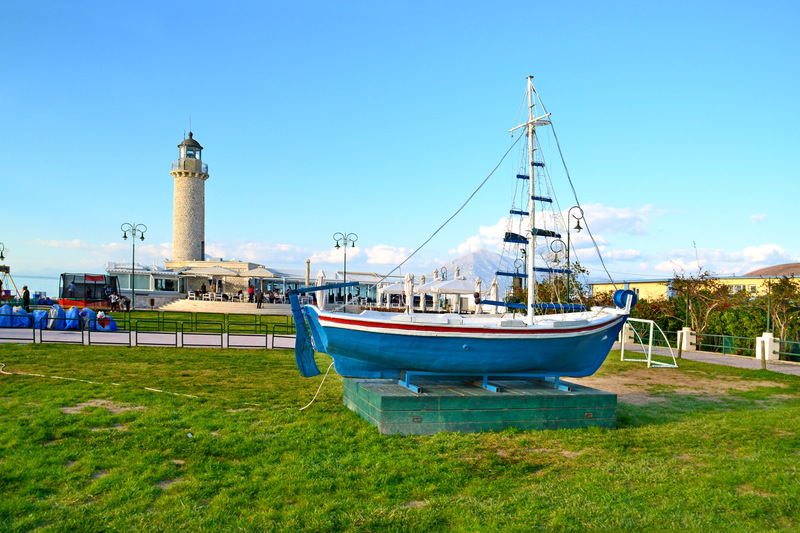 Whether it's a mid-winter visit to enjoy the carnival, or a mid-summer visit to sample the city's nightlife, historic sites, and nearby beaches, Patras is a wonderful place to spend some time.